This is a buzzy series right now because I believe there is a movie on its way based on this book. 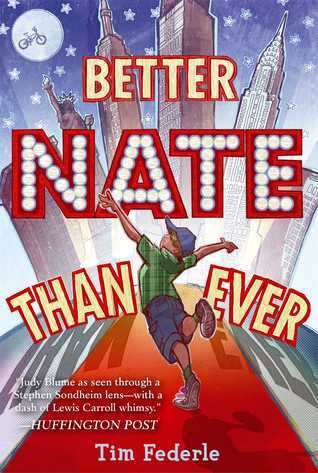 Nate is a new kind of children’s hero, a modern protagonist who might not have been given top billing even a decade ago (he may have been a sidekick in, say, a Wimpy Kid type book). Nate is (admittedly) overweight, not athletic, not good looking, not really good at much. His dream, shared with his best friend, Libby, is to become a Broadway star. And so, Libby helps him sneak away from home, board a Greyhound Bus, and head to the Big Apple to audition for E.T. the Musical. Once in New York, Nate is on his own and must use his wits (of which he has plenty) to find his way to the audition and wow the directors. As the story progresses, it’s apparent that Nate is awed by the city and the possibilities it offers, including when he sees a boy kiss another boy. Yes, as a reader, especially as an adult, we are made to wonder, is this kid gay? He’s into theater, and not into sports, so if there stereotype is true then he MUST be. He’s “uncertain” about his sexuality, which he states directly near the beginning of the novel, and lets us know that the topic is NOT up for discussion. If Nate is one thing, he is self-aware. Bringing this issue to light, though, shows that maybe we are ready for this kind of discussion with our kids. If it’s no big deal to Nate, why should it be a big deal to any of us? Other issues, such as alcoholism and cancer, are alluded to in the story as well. We know Nate doesn’t exactly have a rosy family life. Who among us does? He comes from a very recognizable family dynamic. But even during the darkest passages of this book, we are laughing. Oh my gosh, is this book funny. And I mean, FUNNY. 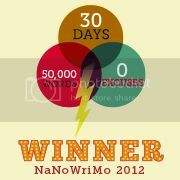 Laugh out loud, knee-slappingly funny. The author’s word choices and comparisons were just hysterical. His description of Nate’s audition where he reads all the parts, along with the voices and noises he makes, are great. We are rooting for Nate to get the part, to be discovered, and to beat out the snobbish theater kids he meets while there. We are left with a cliffhanger at the end of the book, which will lead us into book 2. I definitely will be following along with Nate to see what happens next. This is a children’s book, but because of the discussion of homosexuality, I’m guessing this is best read by older kids. If you’re at all uncomfortable with your child reading this then I’d suggest reading it first. There’s nothing bad about it, and it might be a good way for you to talk to your child and explain what it means to be gay and that it doesn’t make that person any different from anyone else.